Set in the not too far distant future (2045) the plot is centered around a virtual reality world, called the Oasis, that seemingly everyone is plugged into to escape having to deal with real life. When Oasis creator, Halliday (Mark Rylance) dies he challenges everyone to find the ultimate game Easter egg that will allow them to become his successor to owning the game world and his fortune. The story then follows Wade (Tye Sheridan) and his group of friends as they attempt to solve the puzzles that will unlock the egg. Upping the stakes is a very determined corporate leader, Sorrento (Ben Mendelsohn), a one time prodigy of Halliday, who will stop at nothing to find the Easter egg before anyone. As a movie Ready Player One states right from the start what it is and doesn't really deviate. It's a fun ride, where we get to watch the various players try to complete the game quest set before them. There are some surface level messages about social media like, not everyone is the same in real life as their online persona, and spending too much time playing computer games is probably not a good thing, but it doesn't get any deeper than that. Personally I did enjoy Ready Player One but it wasn't quite what I was expecting (bearing in mind my entire impression of the film going in was from one trailer). In the trailer we see vistas of a slum city trailer park unlike anything I've ever seen before. It's like the world is so over populated that they just started stacking trailers on top of trailers to create cheap housing instead of building actual cheap housing apartments. To me, that world, which is the real world in the movie, looked way more interesting than the game world. I think I wanted to see more of that, and the characters who might live there than what I got. The real world is where the real stakes happen but I got the impression the movie was holding back some what in order to avoid anything harsher than a PG-13 rating. Most of the film happens in the Oasis where, if you die, you can just start again - though I'm pretty sure hardened gamers will tell you that's a big deal when you've put weeks (even years) of time into your character to level them up. I found it hard to connect with the characters in a way that really made me care about them. Wade we meet in the real world right from the start but we don't learn enough about him to be too invested before meeting his Oasis avatar/persona. Everyone else we meet in the Oasis first. This disconnect between the real world and the Oasis kind of works against getting to know the real people behind the avatars. Which is possibly why I thought we'd see a lot more of the real world than the Oasis. I will say, don't go into this film just for the nostalgia cameos. Some of them are so quick you won't even be sure if you saw them. As fun as it is to spot the various references to pop culture, the speed at which they happen is deliberately designed to prevent you from being too distracted by them. I never found myself playing 'spot the cameo' for very long, even in scenes where there are a lot of cameos to spot. 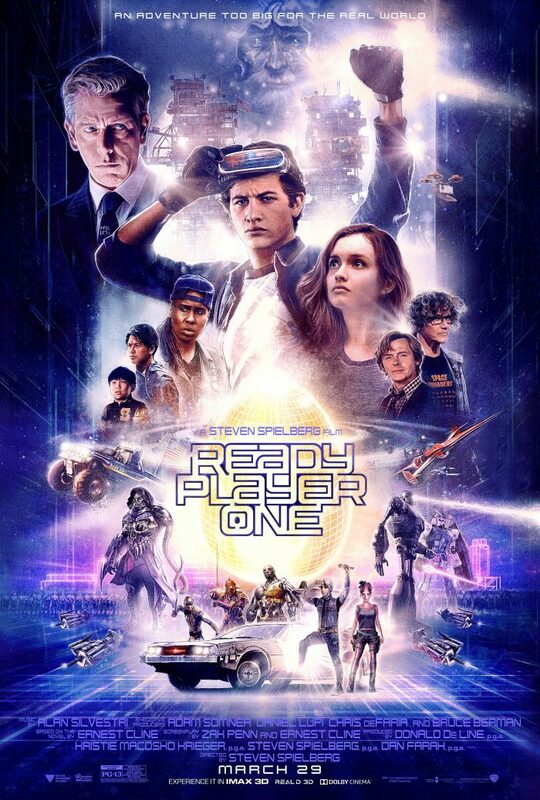 Overall Ready Player One is a fun movie with visually stunning CGI that all looks very convincing, given that it didn't need to be, since we know it's all happening in a computer game. At no point did poor CGI take me out of the film. It never gets too deep into teaching life lessons or examining social issues, though you could probably glean a bit more from it than I did if you really wanted to analyse the movie. It's pretty much Steven Spielberg doing what he does best, fun adventure films that entertain you for a couple of hours. It may appeal more to long time gamers but there's enough there for most people with a passing interest in technology and social media to enjoy.